A make rock ptarmigan gets a tiny transmitter. A biologist is crimping the fastener on the necklace. With its bright red eye combs and snow white plumage, the rock ptarmigan was striking. But this ptarmigan was decked out with even fancier attire, a necklace that sported a small VHF radio. The bird was one of 22 ptarmigan wildlife biologist Rick Merizon equipped with the small transmitters in May of 2014. Merizon coordinates the statewide small game program and is in the middle of a three-year study of rock ptarmigan along the eastern Denali Highway in game management unit (GMU) 13B. Merizon wants to know if birds from areas less accessible to hunters disperse into areas where birds are more easily accessed by hunters via roads, and serve to replenish harvested birds. 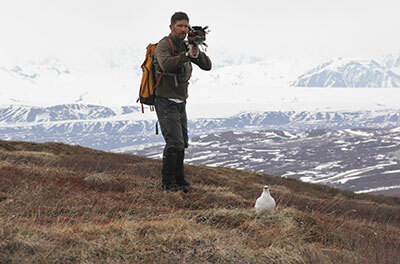 He’s monitoring the annual movements of rock ptarmigan throughout the eastern Alaska Range. He’s already gaining some insights into the birds’ springtime return to their breeding areas. Radio tracking devices for birds are sometimes worn as small backpacks; the walnut-sized transmitters Merizon uses are attached to “necklaces” and rest below the birds chin, with a short antennae. In open country, flying in a small plane with a receiver, biologists can effectively locate these collared birds from five to eight miles away. The birds are captured using one of two primary methods. The first is a “noose carpet,” a 1-foot by 3-foot piece of poultry fencing with 50 to 60 monofilament nooses tied to the fencing wires. Laid flat on the ground like a sheet of tiny footsnares, the monofilament loops effectively tangle in the ptarmigans’ toes. The highly territorial and defensive males are lured to the trap by placing an actual mounted male rock ptarmigan right in the middle of his territory, with several noose carpets adjacent the “intruder.” The second method is a handheld net gun. This gun is shoulder fired at about 15 to 25-feet from the bird and deploys a 10-foot by 10-foot net that entangles the bird. Wildlife biologist Rick Merizon takes aim at a ptarmigan with a shoulder fired net gun. See the link in the article to the video to watch an entire capture. Captured birds are weighed, aged, and then equipped with the small radios. “We have 22 collars out right now, and we’re hoping to get about 30 total,” he said. Mid-May is the breeding season, and the hens will nest in late May, laying eggs that take about three weeks to hatch. In mid-to-late June Merizon will be looking for chicks. Merizon plans to return in the late summer before hunting season and estimate how many of the chicks survived the summer. 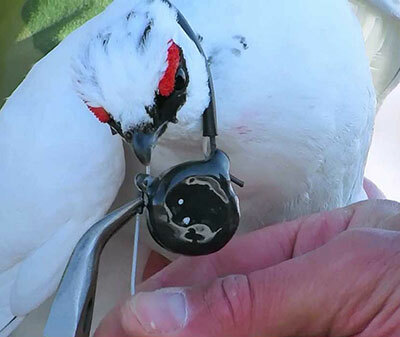 Merizon is also using radio necklaces to study the movement, distribution and survival of willow ptarmigan south of the Alaska Range in the area slated for the Susitna-Watana Hydro project. It’s an area already popular with bird hunters. 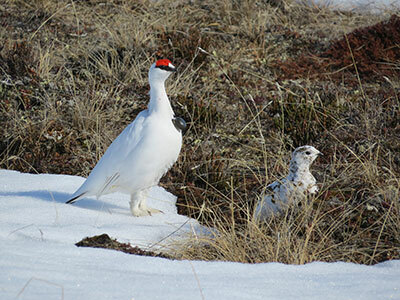 The willow ptarmigan collaring effort is a small part of a large joint study between ADF&G, University of Alaska Fairbanks, and the Alaska Energy Authority. Merizon is working with Graham Frye, a PhD candidate at UAF, looking at the birds’ movement patterns and distribution and how they might be affected by the construction of a road. A transmitting ptarmigan and a hen. Rock ptarmigan surveys are also taking place north of Fairbanks, thanks to Cameron Carroll, the new small game biologist based in Fairbanks. She worked throughout May near Eagle Summit and Eagle Creek, in a 13-square-mile area bisected by the Steese Highway. In the late 1960s and early 1970s, Fish and Game biologist Bob Weeden established and conducted rock ptarmigan surveys in that area. Carroll is replicating his surveys to compare observations, walking the area and documenting territorial males. So far, she’s covered about three-quarters of the area, which is popular with hunters. Carroll will be conducting ruffed grouse surveys as well, and looking into some habitat improvement projects for grouse. Video is available showing the use of a noose carpet and net gun to capture ptarmigan and the processing and deployment of the radio collar. Video is also available of sharp-tailed grouse courtship at a lek in Interior Alaska.